Copyright: © 2018 Maury J, et al. This is an open access article distributed under the Creative Commons Attribution License, which permits unrestricted use, distribution, and reproduction in any medium, provided the original work is properly cited. Purpose: The benefits of Physical Activity (PA) considered as a major supportive care in cancer patients, on survival, and recurrence risk is largely disseminated in public communication. However, these data must be taken with caution. The main objectives were to review the evidence and limits of studies reported regarding the post-diagnosis PA role on cancer survival and recurrence risk to secondly discuss of research perspectives on PA programs. Method: The narrative review included all published or ongoing studies in English during the last 20 years related to PA, survival and recurrence risk with a systematic search on main databases. Results and discussion: The current evidences regarding the PA role on survival and recurrence risk were only based on cohort studies, mainly in breast cancer. The major methodological limits identified as the lack of PA change assessment, PA level assessed largely by self-reported methods and the significant inter- but also intra- variability make the interpretation of data very. Beyond the use of rigorous RCT, the major issue is to develop adapted and personalized interventions to progressively increase PA level overtime in cancer survivors. Conclusion: Despite the lack of causal relationship between post-diagnosis PA, survival and recurrence risk, the review underlines several interesting research perspectives. The future PA interventions, using innovative tools and integrated to the “real-life” will argued for the potential antitumoral PA role growing in literature. The prevalence of cancer has been steadily increasing for many years, making it the second leading global cause of death . This increase is due to the optimization of diagnostic tools, main and adjuvant treatments, as well as recent developments in personalized medicine, thus promoting longer survival with cancer [2,3]. These advances justified the inclusion of supportive care during treatment and recurrence prevention periods. Physical activity (PA) is now considered as a component supportive care strategy. The role of PA interventions was to improve quality of life, more recently to decrease psychological concerns such as fatigue, anxiety, depression, pain, self-esteem trouble, body image concerns and social isolation . Many cohort studies and randomized clinical trials have respectively indicated and showed benefits of PA interventions on these markers predominantly in breast cancer, but also in prostate, colon or blood cancer [5-7]. Over time, PA has also been recognized to improve specific physiological parameters. Several meta-analyses have shown strong experimental evidence to conclude that PA improve cardiorespiratory parameters [7-9], body composition and muscle mass [7,8,10], inflammatory markers, glucose metabolism or immune system [11-13]. Given the benefits observed in the literature on these bio-psycho-social parameters, all international expert panels recommend implementation of adapted physical activity (APA) programs, as an important non-pharmacological intervention in addition to the main treatments during all care phases for most cancers and even immediately after diagnosis [14-16]. An APA program may alleviate adverse events related to cancer and its treatment, and may improve cancer treatment efficacy . In fact, emerging evidence from pre-clinical studies indicate that exercise training may control cancer progression through direct effects on tumour intrinsic factors (growth rate, metastasis, tumour metabolism, and immunogenicity of the tumour) and regulates tumour growth through interplay with systemic factors . Several meta-analyses and epidemiological studies seem to support this assumption [14,18,19]. After the cancer diagnosis, physical inactivity is raised in cancer patients due to the effect of main treatments on functional capacities that could be increased by psychological components such as anxiety, depression and reduced self-esteem . Insidiously, this physical inactivity contributes not only to physiological deconditioning, psychological and social consequences of cancer described above but also to long term deleterious effects associated with increased mortality and recurrence risk, thus constituting a major public health issue. In this sense, different meta-analyses seem to report a positive association between the practice of PA after diagnosis, improvement of survival and decreased risk of recurrence [15,21-25]. These data contribute to the emerging idea that PA may be considered as a specific adjuvant therapy in cancer with a potential antitumor role . Even if the benefits of PA on survival and the risk of recurrence after cancer treatment is largely disseminated and admitted in public communication, some authors highlighted numerous methodological limitations and large variability of proofs between the different cancer type suggesting that these data must be taken with caution [14,16,23,26]. Now regarding all these parameters, the issue well recognized in the scientific community is to conduct randomized controlled trials with rigorous methodologies to optimize the current recommendations and to define APA programs that can be integrated into the “real life” care of cancer patients. First, the narrative review presents the evidence and the limits of published studies regarding the post diagnosis PA role on cancer survival and recurrence. Secondly, the review details research perspectives to optimize the development and evaluations of APA programs. For this narrative review, studies published in English in the last 20 years (between January 1998 and May 2018) were identified by a systematic search on Pubmed, ScienceDirect, Web of Science and Motrial. Combinations of the following terms were used (MeSH Terms): cancer OR physical activity OR exercise OR survival OR recurrence OR tumor OR free-disease survival. The research algorithms were combined with filters to specially identify randomized controlled trials (RCT) and cohort studies. In addition, publications integrated to the present narrative review were checked from relevant meta-analysis published in each cancer type. Regarding cancer survival and recurrence parameters, we also searched the RCT in progress in ClinicalTrials.gov (U.S. National Library of Medicine), INCa database, Chinese Clinical Trial Registry (ChiCTR), Cochrane Central Register of Controlled Trials, European Clinical Trials Register, International Clinical Trials Registry Platform (ICTRP), ISRCTN registry, and UMIN Clinical Trials Registry (UMIN-CTR). After screening consequently titles, abstracts and full texts, two researchers (JM, PhD and GN, PhD) independently reviewed and selected eligible publications aiming to investigate the benefits of PA on reporting outcomes (survival, recurrence). Studies were selected if they included adult patients with a cancer diagnosis established before the study beginning. We focused our searches on the main cancers studied in the literature: breast, lung, colon, prostate, pancreatic and hemopathy. Studies were excluded if they did not provide any details on methodology and/or PA program. Extracted data included the first author’s name, year of publication, tumor stage and site, treatment status, study objective, sample size, study design and PA program methodology (intensity, frequency, modalities and duration), adherence rate and delivery mode (supervision, group, individual etc.). The results on survival, free-survival and recurrence parameters were extracted. When there was insufficient information, the relevant corresponding author was contacted. Table 1. Characteristics of the 28 studies identified about the relation between post diagnosis physical activity, survival and recurrence in cancer patient. No initial PA evaluation Until date of death or recurrence orlast contact Recreational PA level ≥10 MET-hours/week associated with a 27% reduction in all-cause of mortality and 25% in breast cancer mortality. No association with breast cancer recurrence. No initial PA evaluation Median follow-up : 6 years Women who engaged in ≥2.8 MET-h/wk of recreational PA had a 35% to 49% decreased risk of death from breast cancer and all-cause of mortality. No information on cancer recurrence. 2987 women Leisure-time PA (questionnaire) evaluated at least 2 years post-diagnosis Median follow-up : 8 years Women who engaged in ≥3 MET-h/wk of (dose-response effect) leisure-time PA had a decreased risk of death from breast cancer, all-cause of mortality and recurrence in particular in women with hormone responsive tumors. Mediand follow-up time for recurrence: 10,6 Higher level of recreational PA (≥17,4 MET-hours/week) is inversely associated with late all-cause of mortality and 25% in breast cancer mortality. 4463 women Self-reported information on recreational PA measured on average 1,8 years after diagnosis. No initial PA evaluation Median follow-up time for mortality: 3,3 years Moderate to vigourous level of recreational PA (≥9 MET-hours/week) is inversely associated with a 46% reduction of all-cause of mortality and 25% in breast cancer mortality. No data on breast cancer recurrence. 435 women PA questionnaire at 1 and 2 years post diagnosis. 2 years Overall survival is statically significantly better for patients who were relatively active. No association with breast cancer-specific survival and recurrence-free periods. Resistance training : 9 exercises (8-12 repetitions) 8 years (Median follow-up: 89 months) No significant association between PA, disease-free survival, overall survival and recurrence-free interval. 1231 women Lifetime PA Questionnaire at baseline (recreational, occupational and household activity). No PA change evaluation Minimal follow-up: 8,3 years for recurrence and 10,3 years for deaths Highest recreational PA activity is associated with a decrease in breast cancer death and all deaths. h/week) compared to inactive women (0 MET h/week) for all-cause and breast cancer-specific mortality. 986 women PA questionnaire in order to identify runner’s vs walkers at baseline Median follow-up : 9 years For the 986 runners and walkers combined, breast cancer mortality decreased an average of 23.9% by MET-H/day. There was a significantly greater decrease in death risk for running than walking. 2361 women PA questionnaire at baseline and at various follow-up points Median follow-up : 7,1 years Moderate to vigorous PA level at baseline (≥3 MET-hours/week) is associated with a 53% reduction of mortality risk. Adherence to PA guidelines (10 MET-h/week) was associated with a 35% lower mortality risk. 1970 women Self-reported frequency and duration of work-related, household and recreational activities during the 6 months prior the inclusion Median follow-up : 7,3 years A statically significant protective association between PA and all-cause mortality. No significant association between PA, risk of recurrence and breast cancer mortality Only a trend for higher levels (≥3 MET-h/week) of PA versus lowest level was reported on these parameters. examination by trained personnel were used to PA assessment. No initial PA evaluation Median follow-up : 7,8 years A moderate physical activity of 2–4 h/week and a high physical activity of more than 4 h/week showed no association with survival after breast cancer diagnosis. 668 men Leisure-time PA questionnaire within 15 months after diagnosis Median follow-up : 8,6 years High PA level (≥27 MET-h/week) was associated with improved colorectal cancer-specific mortality, overall mortality. 736 women PA level assessed 5 months and 12 months after diagnosis Median follow-up : 5 years Participants with some level of PA (≥150 minutes/week) following diagnosis had 25% to 28% lower risk of all-cause mortality within 5 years of diagnosis than sedentary participants. Increases in PA from five to 12 months postdiagnosis was associated with reduced colorectal specific mortality by 32% to 36% and 31% for all-cause mortality. 573 women Leisure-time PA (questionnaire) evaluated at least 1 year but no more than 4 years post-diagnosis Median follow-up : 9,6 years High PA level (≥18 MET-h/week) compared with low level of PA (≤3 MET-h/week) was associated with an improve in colorectal cancer-specific mortality, overall mortality. 832 patients PA level assessed by questionnaire 6 months after completion of adjuvant therapy Median follow-up : 3,8 years High PA level (≥18 MET-h/week) compared with low level of PA (≤3 MET-h/week) was associated with a reduction in recurrence-free survival and overall survival. 8,1 years High recreational PA level (≥8,5 MET-h/week) was associated with lower all-cause mortality. 11,3 years Postdiagnosis leisure time PA ≥7h/week, compared with none, was associated with a 31% lower all-cause mortality risk. No data on colorectal cancer recurrence. 10 years High level of recreational PA (≥17.5 vs 3.5–<8.75 MET-h/week) was associated with a significant 31% lower risk of overall prostate cancer-specific mortality. No data on cancer recurrence. 830 men Postdiagnosis PA was measured up to 3 times per patient by questionnaire Follow-up between 1 and 17 years High level of PA (>119 vs ≤42 MET-h/week per year) was associated with a significantly lower all-cause mortality risk. household work ≥1 h/day or exercising ≥1 h/wk, compared with less active men within each activity type. had a 49% lower risk of all-cause mortality. No data on prostate cancer recurrence. 1455 patients PA questionnaire every 6 months Follow-up between 1 and 18 years Men who walked briskly for 3 h/week or more had a 57% lower rate of cancer recurrence than men who walked at an easy pace for less than 3 h/week. No data on overall survival. Frequency: Combination of endurance (3 to 5 times weekly) and resistance (2 times weekly) exercises Follow-up: 2 years after transplatation Exercise intervention patients trend to lower total mortality rate than controls. The effect on non-relapse mortality was not statiscally significant. PA assessment by questionnaire at 6-month follow-up. Median follow-up : 5,1 years No significant effect of PA program on progression-free survival. Specific trials designed to answer this question are needed. PA physical activity, CWLS Collaborative Women’s Longetivity Study, VO2peak Peak oxygen consumption, MET Metabolic equivalent. Table 2: Characteristics of the 18 randomized controlled trials in progress about the effect of post-diagnosis physical activity intervention on survival and recurrence in cancer patients. Frequency: Supervised center training sessions in group 60 minutes twice a week. individual weight loss, diet and physical activity goals, incorporated into a 2-year standardized, structured telephone and mail-based intervention. Supervised and group-based exercise in center two times a week (60 minutes per session). The program consists of warm-up, exercises for balance and flexibility, progressive resistance training, and stretching and relaxation. Frequency : 2 sessions/week on cycloergometer in center and a self-paced increase in physical activity during daily life using a pedometer with a daily step goal as a motivational tool. Frequency : 3 hour/week supervised in-hospital program of aerobic (stationary cycle) and functional muscle training at high intensity. PA physical activity, PE primary endpoint, SE secondary endpoint, IPAQ International physical activity questionnaire. By contrast with the well-known messages disseminate in medical literature and public health communication, the systematic review underlines clearly the lack of causal relationship between post diagnosis PA and survival or cancer recurrence. Of the 31 studies included, only 3 are RCT in the 5 main cancers (Figure 1) [27-29]. The studies incorporating experimental follow-up design reported no significant effect of a PA program on overall mortality, specific mortality or risk of recurrence. As noted by the authors, these studies were not designed or did not have the statistical power (e.g., small number of participants) to show the efficacy of the PA program on these parameters. Nevertheless, observational cohorts indicate positive relationship between PA level and overall survival (23 of 25 cohorts) or specific survival (10 of 14 cohorts) (Table 1). This relationship is described in the broad majority of studies as part of a recreational physical activity practiced daily by patients and not supervised and well-described PA program during and/or after treatments. In addition, based all studies included, 9 reported data on the risk of recurrence in cancer patients. Of these studies, only 4 reported a significant relationship between recreational PA and recurrence risk [30-33]. 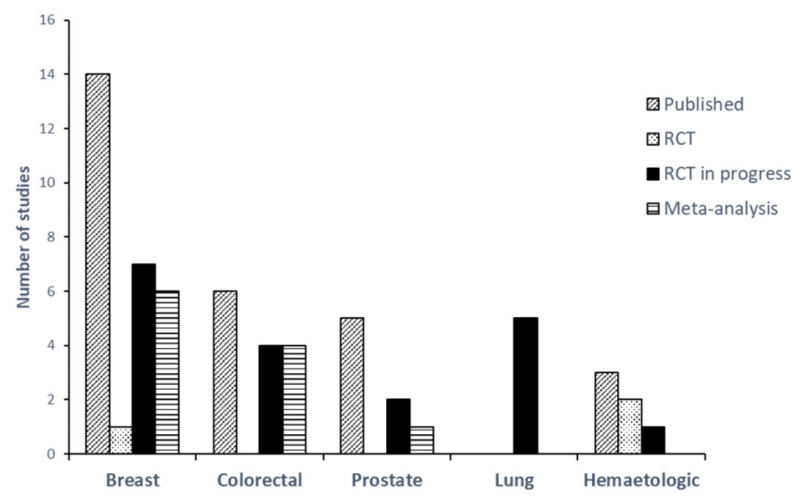 Figure 1: Number and type of studies published or in progress regarding about the relation between post diagnosis physical activity, survival and recurrence in cancer patient. All these data issue from literature are supported by 11 meta-analyses [21,23-25,34-40]. It should be noted that all the studies included in meta-analyses are found in our literature review without exception. In these works, the positive relationship between PA level, overall and specific mortality is described only in breast, colon and prostate cancers with increased effects in patients with higher PA levels. For example, the meta-analysis of Schmid et al. [24,] reported a 41% decrease in overall mortality and a 34% decrease in specific mortality in breast cancer patients with physical activity levels ≥ 3MET.h/week. The authors also describe a dose-response effect with decreases of 13% and 34% in overall mortality for increases of 5 MET.h/week and 15 MET.h/week respectively. Similar results have been found in colon and prostate cancers [21,24,35,]. Interestingly, although these meta-analyses did not suggest a causal relationship, the positive effect of PA on overall or specific survival was observed after statistical analyses incorporating adjustment on different clinically relevant variables in cancer (e.g., cancer stage, treatment, smoking status, co-morbidities etc.). Regarding the relationship between the PA level and the risk of recurrence, only meta-analyses performed in breast cancer reported relevant data even if the authors specified that the results must be taken with caution given the small number of studies included in the analysis [21,24,25,34,]. Thus, Ibrahim and Al-Homaidh 2011 reported a 24% decreased risk of recurrence in breast cancer patients with AP levels ≥ 3MET.h/week. However, as mentioned in some meta-analyses and systematic reviews [16,21,41,], this narrative review highlights major limitations to be considered in data interpretation from the literature (Table 1). 1/ Change in PA level during post-diagnosis follow-up of patients has rarely been studied in observational cohorts with baseline assessment present in less than 20% of studies . To our knowledge, only one study cohort was interested in the effect of the change in PA level, evaluated 1 year after the baseline assessment, on overall survival but reported no significant relationship . Yet the change in PA level during follow-up is a major consideration in assessing the effect of AP level on survival. For example, it has recently been shown that an increase in PA levels assessed before and after cancer diagnosis was associated with a reduction in long-term mortality . 2/ In all cohorts, PA was assessed with declarative methods using long-term recall questionnaires or interviews. This methodology is interesting for epidemiological studies to estimate individual PA dose, but with important risks of bias . Some authors argued that these self-report methods capture only 50% of objectively measured energy expenditure . In this sense, Matthews et al. recommend to combine these questionnaires with objective measure tools such as accelerometer or pedometer. Another alternative should be to repeat frequently self-report during patient follow-up estimating the PA level achieved in short term recall to reduce the risk of bias . 3/ The review also points out heterogeneity of cancer and stage follow by observational cohorts. For example, no cohort has been achieved in lung cancer which remains the highest mortality rate cancer (Figure 1). More than 50% of the studies included breast cancer with a large severity, stage I, II or III. These data therefore indicate that it is scientifically inconsistent to overgeneralize the causal relationship between the PA level, overall and specific survival to all cancer types. 4/ The review also underlines the heterogeneity between the beginning and the end (from 0 to 4 years after diagnosis of PA programs, as well as the duration of follow-up (from 1 to 18 years after diagnosis) (Table 1). 5/ Finally, the review indicates substantial differences between PA programs. For example, the cut-offs defined can vary from 3 to 27 MET.h/week depending on the studies and cancer types [45-47]. Most studies use the term of “recreational PA” associated with survival or risk of recurrence. This term includes a broad range of activities such as running, swimming, cycling, gardening, and skiing (etc.) that patients can practice daily without having a rigorous PA program. It is well recognized that an inadequate description of PA in studies is a major factor contributing to the absence of PA prescription by clinicians [48,49]. All these limitations make the analysis and interpretation of these data very complex even after rigorous meta-analyses published. For these reasons, the role of PA and PA supervised programs in survival and recurrence risk remains elusive in patients with cancer as has been suggested by some researchers [16,21,23,41,]. As it is well recognized in literature, physical inactivity, defined as an PA level of less than 150 minutes per week by several academic organizations [50-52] is a major problem in cancer survivors [14,20]. Although data are heterogeneous across studies, the percentage of inactive patients increased compared to healthy population [51,53,54]. Because of their important side effects, the main antitumor treatments favor this phenomenon in this population . For example, a large French cohort within multiple cancer types showed that about 90% of patients do not increase their level of PA two years after diagnosis and this observation is worsen at 5 years . Thus, the major issue for future research projects is to develop adapted programs to increase the PA level in cancer survivors for regular and self-administered long-term practice, which is essential to improve survival and reduce recurrence risk . The first message widely found in the literature is to carry out rigorous RCT with appropriate designs and well-described PA program. Indeed, it seems essential to evaluate non-pharmacological interventions such as PA programs [48,49]. Overall, the analysis of 137 clinical trials evaluating non-pharmacological interventions showed that 61% did not report sufficient details to be replicated [26,57]. These methodological considerations are necessary to guide physicians and researchers towards the implementation of structured and personalized AP programs, provided that the characteristics of the populations studied are homogenized as much as possible . However, when we read the declaration of RCT in progress on ClinicalTrials.gov, methodological limitations persist. As shown in table 2, only 7 out of the 18 ongoing RCT were specifically designed to investigate the survival or cancer recurrence as primary endpoint. For trials analyzing survival or cancer recurrence as a secondary endpoint, we will therefore find limitations in the interpretation of the data, particularly in relation to the statistical power problem described in numerous RCT already published [27-29]. In this case, it seems important to standardize, at least by cancer type, the parameters evaluated (e.g., duration of follow-up to assess survival) as well as the tools to measure accurately PA in patients as discussed previously . It should also be noted that only one RCT in progress combines two tools to determine PA dose and five use an objective measure such as accelerometer or pedometer (Table 2). This standardization will be easier to compare studies and for meta-analyses . In the same sense, we mentioned the importance of evaluating the change of PA level over the duration of patient follow-up and this has been implemented in four ongoing RCT (Table 2). From a methodological viewpoint, it is also necessary to define precisely the three major components of PA programs, duration, frequency and intensity [14,48,49]. Most of the data available on RCT in progress do not allow to precisely identify the content and intensity of the PA program sessions, although the duration and frequency are generally well described (Table 2). Beyond these methodological considerations, the content of PA programs should lead to long-term behavior change in cancer survivors. As reported by Hudis and Jones , promoting long-term PA is a truly complex task, particularly in cancer. Although the global objective would be for all patients to achieve at least the general recommendations (150 minutes/week of moderate to vigorous PA combined with 2-3 sessions/week of resistance training), it is well recognized that minimal changes in PA levels in inactive patients would produce significant improvements in survival and recurrence risk [14,20]. Yet low adherence to PA interventions associated with inclusion difficulties is frequently reported in clinical trials both during and after the treatment phase [26,60]. Thus, the major currently question is: what tools have been identified in the literature to increase the PA level at long-term in cancer survivors? . From this PA behavior change perspective, taking into account barriers and facilitators to practice is one of the major components [20,61-63]. To date, the main barriers reported in literature differ according to the cancer type, in particular regarding physiological health disorders, even some components seem transverse to all patients: lack of time, geographical location in relation to the hospital center, difficulty of access to practice. However, the broad majority of studies on the PA effects in cancer survivors have been conducted in hospital centers, which may explain the adhesion and inclusion difficulties described [26,60]. As shown in table 2, although many ongoing RCT are being conducted in hospital centers (2/3 of studies), there is growing interest in implementing PA programs integrated into the care pathway based on the facilitators recommended. The two main components to facilitate the practice of long-term regular PA in cancer survivors are home-based interventions and supervised sessions [26,61,64-66]. Indeed, the number of studies evaluating the effects of using new technologies (e.g. telephone, e-mail, web/online support, mobile application etc.) to promote PA among cancer patients continues to increase [64,65]. According to some authors, the evolution of traditional model follow-up in cancer patient centers is necessary and must be reconfigured to correspond to the real needs of patients . To this notion of home-based intervention is added the notion of supervised session. To our knowledge, all the studies carried out or in progress (Table 2) on the implementation and evaluation of home-based programs to induce a PA behavior change in cancer survivors are conducted unsupervised, whether by telephone, e-mail, web support or via mobile applications. The use of these non-face-to-face new technologies, defined as “broad-reaching approaches”, is a financial and feasible interesting solution, but limited and heterogeneous effects on long-term PA levels are reported [64,67]. As reported by Buffart et al. , the effects are greater when programs used professional supervision, whether on quality of life, physical ability or patient adherence to the intervention. An important point raised by the authors is that PA sessions should be conducted by a qualified health professional, whether supervised or not [56,65]. A potentially more effective solution evocated in literature to encourage patients towards autonomy in PA practice would be to combine supervised sessions in hospital-center with unsupervised home-based sessions, even if the risks of low adherence to the supervised program remain . Currently, 7 ongoing RCT (Table 2) have used this methodology and the results will allow us to make progress on this point in the coming years. Regarding the intervention durations implemented, whether in published trials or in RCT in progress, we find a significant heterogeneity (from 4 weeks to 2 years) which does not allow us to determine an optimal methodology. Some authors suggest that the 12-month PA program would be too long and would not allow patients to be autonomous in their practice but studies are still needed to show this . In any case, it is important that interventions respect progressiveness in the development of PA interventions. This progressiveness must apply both to the intensity of the sessions but also to the frequency. The implementation of AP programs with a pyramidal design with (1) progressive then degressive evolution of the number of supervised sessions per week associated with (2) an increase of the sessions number in autonomy during follow-up, constitutes an interesting solution to be evaluated scientifically to induce a PA behavior change in cancer survivors. Another innovative solution mentioned in the literature but, to our knowledge, not yet evaluated in cancer patients is the use of videoconferencing, which would make it possible to carry out PA interventions both at home and supervised by a qualified health professional. Another research perspective to be developed would be to integrate PA interventions into comprehensive patient support as recommended in the latest report of the World Cancer Res Fund International. The AP programs would then be combined with adapted nutritional follow-up and education sessions to potentially optimize benefits on survival. For example, disease management program would sensitize the patient to the interest and benefits of PA, on physical abilities, quality of life and survival, which are facilitating components highlighted in the literature [20,62,63]. For all these solutions, future studies on PA integrated in the care pathway should be directed towards a clinical application favoring the implementation of an adapted and personalized medicine directly involving the patient. From an ethical perspective, many issues need to be addressed in future clinical research. According to some studies, patients would prefer to begin PA interventions after treatment, but this is linked to a lack of patient information and awareness, which further justifies education sessions [20,62]. However, the cancer diagnosis would constitute a “teachable moment” to PA behavior change, even more given the benefits described in the literature regarding PA interventions carried out during treatment [63,68,69]. Another important point is to target the less active patients because of the specific needs of this population and yet it would appear that they are the least involved in clinical trials (inclusion bias) . Finally, the question of setting up a control group is also open to discussion because today it seems difficult to not purpose PA interventions to cancer patients given the current general recommendations. Thus, in future clinical research, it would be appropriate to carry out several groups of interventions by varying different tools and/or modalities: supervised vs unsupervised sessions; place of practice (hospital vs home-based); duration, frequency and intensity of the intervention; individual vs group sessions; follow-up tools (videoconferencing, mobile application, telephone follow-up, etc.). The PA role on survival and cancer recurrence is based only on observational cohort in the five major solid tumors studied: breast, colorectal, lung, prostate and hematology. The lack of RCT showing causal relationship and the methodological limitations of cohort makes data interpretation complex to generalize. Nevertheless, these observational cohort studies provide many interesting research issues to investigate the specific PA role on survival and recurrence risk. The major challenge of current and future research projects is to develop adapted and personalized PA interventions, tailored as much as possible to the type of cancer, to induce progressively a regular and self-administered long-term practice. For this purpose, it seems essential to develop RCT with rigorous methodologies and adapted PA programs that consider patients “real life” problems. Many innovative solutions exist such as mobile applications, internet support or videoconferencing, but it is now necessary to find PA interventions that induce optimal benefits, using home-based and/or supervised sessions depending on the populations studied, on the PA level, survival and the recurrence risk. These observations and clinical research hypotheses also suggest the potential antitumoral PA role reported in pre-clinical animal studies . Although the underlying mechanisms are still largely unknown in different forms of cancer, some parameters such as inflammation, the immune system or insulin appear to be involved in tumor development. These potentially PA-modulated parameters could also be incorporated into the evaluation of future clinical research projects. The authors gratefully acknowledge the Supportive Care Department team and Research Department team (Institut du Cancer de Montpellier, ICM), the Fondation ARC, the SIRIC Montpellier Cancer (Grant INCa-DGOS-Inserm 6045), and Cedric Baudinet (V@Si company).